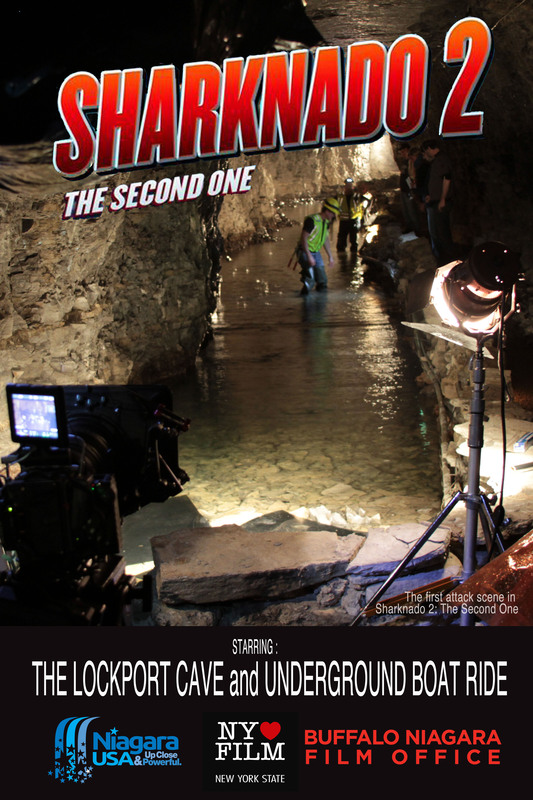 (August 21st, 2014) On the day of the theatrical release of “Sharknado 2: The Second One”, Lockport Cave and Underground Boat Ride Owners Clancy Burkwit and Thomas Callahan were honored for their commitment to film production. Niagara Tourism and Convention Corporation President and CEO, John Percy was on hand along with Buffalo Niagara Film Commission Chairperson Cindy Abbott Letro, and Lockport Mayor Ann McCaffrey to present Burkwit and Callahan with a special plaque commemorating the event. The Lockport Cave and Underground Boat Ride has been host to numerous Television and Film Productions including in the past year along with Sharknado 2: The Second One, the feature films 33, and The American Side. For Sharknado 2 the cave doubled as an underground subway access tunnel which was accessed through Central Park in New York City.